Audio of a meeting in which Agrizzi used the ‘k-word’ was played at the Zondo commission on Tuesday. At the Zondo commission of inquiry into state capture on Wednesday, former COO of hugely controversial facilities management company Bosasa Angelo Agrizzi admitted to racism. Audio in which Agrizzi is heard using the ‘k-word’ several times was first leaked and reported on late last year by City Press, before the former COO was the household name he has now become following his ongoing testimony at the commission. Agrizzi claimed the slur was said at a meeting which took place at his house between himself and family members of former Bosasa CEO Gavin Watson. He also claimed they coaxed him into saying what he did in the clip, recording it purposefully to discredit him. He said he was ”half asleep” during the meeting with Watson’s brother Jarred, who brought along Gavin’s two children, Lindsay and Roth. Agrizzi told the commission he had earlier consumed alcohol after working through the night. As the commission began to play the clip, Agrizzi expressed his embarrassment. The former COO continued, saying he understood if people judged him for his racism, but felt the whole three hours of the clip should be played in order to understand ”where it all came from”, adding that he was provoked. Asked for clarity on that, he added: “I didn’t understand the impact that having a carrot cake and a gin would have on me. It’s not an excuse”. According to City Press, the audio recording resulted in a crimen injuria case, opened by Agrizzi’s former colleagues, Johannes Gumede and Papa Leshabane. In the audio, a man believed to be Agrizzi can be heard saying: “What you need Papa for? … You don’t need Joe … what you need him for? … What I’m saying to you [is] what I can’t understand is how on earth your father listens to Papa and Joe. The other voices barely participate in the conversation, save for a few audible responses. Pretorius said the racist remarks had implications on everyone and the rest of the country. ”Chairperson… there is no excuse… I ask you to look at the facts, I did what I did here, I can’t influence your decision… but what I can do is ask you to allow whistleblowers to come through,” Agrizzi said. ”What I heard you say there was extremely offensive and unacceptable, but that does not mean I won’t examine your evidence, consider it, and deal with it in a way a judge should,” said Zondo. The recorded meeting took place in 2018 at Agrizzi’s house. He detailed how, in the previous months following his decision not to return to work, Bosasa CEO Gavin Watson sent colleagues, his family members and a lawyer to Agrizzi’s home to ”try to buy my silence”. Agrizzi said he was offered millions of rands for his silence on the corrupt activities at the facilities management and security company. The offer from Bosasa to Agrizzi was a R5 million to R10 million payment per annum for five years, providing he could ”keep quiet and not mention anything” which could make Bosasa look bad. He testified that he had decided in March 2017 it was time to blow the whistle and expose Bosasa. Agrizzi said he sought advice from legal minds such as former prosecutor, now DA MP Glynnis Breytenbach, and advocate Barry Roux, a prominent defence advocate. An individual in the media advised him to tell the truth openly, after which he then released a press statement in August 2017 announcing his intention ”to come clean” and spill the beans on Bosasa. However, isolating himself from Bosasa brought the wrath of threats from everyone including Gumede and Leshabane, he said. Basson, who believes the audio was obtained and leaked by Gavin Watson’s sons after Agrizzi reportedly told News24 he was ready to spill the beans, appears to be mentioned in the audio, with the former COO boasting about his contacts in the media. 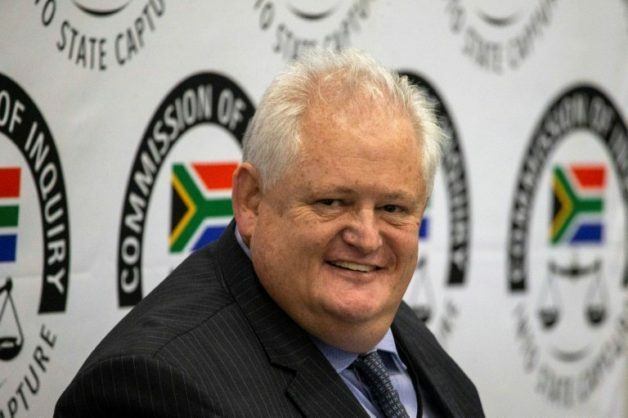 In the extended audio of the meeting, which was published by journalist Pinky Khoabane – who has since been identified by Agrizzi as one of the journalists who allegedly received payments from Bosasa in return for positive coverage – on her website Uncensored Opinion, Agrizzi says Leshabane didn’t like him because he was more able to “fix up the press” than his colleagues. “How did I form my alliance with Derek (possibly Carte Blanche’s Derek Watts), with Adriaan (possibly Basson), with all those people?” he said. He went on to allege the journalist identified as Adriaan used to come to his house with his kids. Basson has strongly denied this, saying Agrizzi lied about their relationship. “I visited his house once as a working journalist after he had turned against CEO Gavin Watson to try and persuade him to spill the beans. I was doing my job as a journalist; trying to cultivate a source with knowledge and information of corruption I have been writing about since 2006,” he said. “I was not present at the recorded meeting between the Watson children and Agrizzi, at which he used disgusting racist language,” he added. “During our once-off meeting at his house, Agrizzi did not use racist language. If he did, I would have left the meeting. Why is Ms Khoabane desperately trying to link me to Bosasa’s corruption and Agrizzi’s racism, when she has not a shred of evidence about this? Only she can answer this question,” he concluded.